Starting with SQL Server 2012, AlwaysOn Availability Groups provided group level high availability for any number of databases for multiple secondaries known as ‘replicas’. The secondary replicas allow direct read-only querying or can enforce connections that specify ‘ReadOnly’ as their Application Intent using the new feature called Read-Only routing which can be leveraged to scale out reporting workloads. However, in SQL Server 2012 and 2014 versions this redirection is only concerned with the first secondary replica defined in the priority list and all the read-only connections are routed only to that one replica by design. This restricts the other secondary replicas from participating in the load distribution process and thereby reducing the load balancing capability. This article provides you with the configuration and testing of read-only routing along with configuring a custom SQL Agent job in an attempt to create an improved load balancing effect. 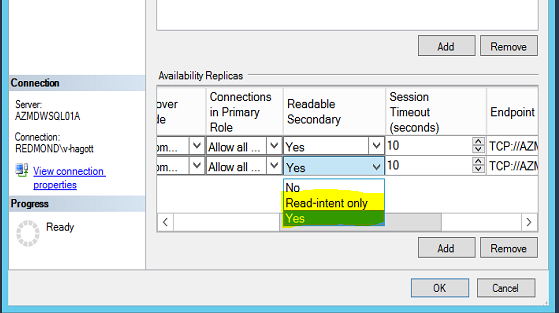 Read-only routing refers to the ability of SQL Server to route incoming read-intent connection requests, which are directed to an availability group listener, to an available readable secondary replica. One of the pre-requisites to support read-only routing is that the availability replicas must be enabled for read access. Let’s take a look at the above steps in details. For example, define a URL SQL01B, so that when SQL01B is in the secondary role, it can accept read-only connections. For each replica that will act as primary, we need to define the corresponding secondary replicas that will act as the routing target for read-only workloads. This means that if the replica is acting as a primary, all read-only workloads will be redirected to the replicas in the read-only routing list. For example, when SQL01A is in the primary role, define our routing list to consist of SQL01B which is where read-only connection requests will be routed first and if it is not available or not synchronizing (Only in SQL Server 2012) connections will go to the next server in the list. NOTE: As a best practice it is always recommended to assign the primary replica name at the end of the routing list separated by comma, in the rare event if all of the available secondary replicas are not available. The read-only routing introduced in SQL Server 2012 is used for redirection and offloading the read queries to the secondary replicas instead of primary replica. However, this redirection is only concerned with the first secondary replica defined in the priority list that we define. Since the primary replica strictly traverses the list and looks for the first replica that can serve the connection request. Once found, all subsequent read-only connections are routed to it. For example, in a multiple secondary architecture, all the read intent queries only hit the first secondary replica in the list while other secondaries do not participate in distributing this load. This limits the load balancing capability among other secondary replicas. To complete the procedure run the code from above in a new query window in SSMS for testing purposes and once verified you can then use the code to create a SQL agent job in all the replicas. This job needs to be run continuously on each replica. The code will only run from the instance that is in the PRIMARY role. rl.routing_priority as "Routing Priority", ar2.replica_server_name as "RO Routed To"
After 30 seconds, notice that the “RO Routed To” column alternates among the available secondary replicas. As evident from above result, this code modifies Read-Only routing list bringing in a new secondary replica into play periodically to cater for the read intent connections essentially creating a load balancing effect. Load balancing using this technique provides a way to get even more use from server hardware that host secondary’s databases and provide reporting applications with better performance and throughput especially for long and resource intensive queries. Please note that this algorithm is limited but it serves the purpose quite effectively. A similar but much robust algorithm has been built into the native SQL engine starting with SQL Server 2016. Great and informative Article. Thank you for taking the effort to write this out.